The Men of the West’. Printed with permission of Leonard Collection. When the nationalist Irish Volunteers were established in 1913, Leonard was brought into that military organisation by his brother-in-law, Michael Kilroy. Kilroy was a Volunteer organiser and IRB member. JJ Leonard rose to the rank of commandant in the IRA's North Mayo Brigade. His role in the IRA gave him access to training camps, active service units and republican funerals, all of which he captured on his Thornton Pickard Camera. Volunteer groups throughout Mayo were photographed as were many rare scenes of public speeches from general election candidates. 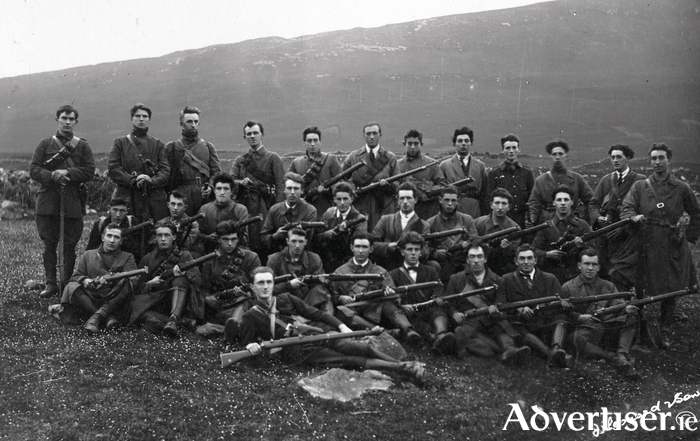 'The Men of the West' photograph was taken shortly after Kilroy's men had claimed a victory at Carrowkennedy when along with inflicting casualties on the Crown forces, the IRA captured RIC men, a Lewis machine gun, rifles and ammunition. The machine gun was a big prize and Leonard photographed several IRA members posing with their trophy. When the fighting of the War of Independence and the Civil War ceased, Leonard fought on the new platforms offered by the local government authorities. He was a rural councillor in the twenties and a county councillor in the thirties. Again, this opened opportunities for him to record Irish life at the time. One fine picture from this era is the opening of the 124 bed County Hospital in Castlebar in 1938, in which Leonard captures the county’s political elite with the same professionalism applied as when he photographed the poorer classes during their plight at the hands of the landed gentry. As a photographer, Leonard did not allow himself be confined to political subjects. His work crossed all disciplines and activities including agriculture, transport, sport and of course his own personal life and family. His own story is remarkable in itself but is even more so for the fact that it is visually documented. Leonard's photographic catalogue is as complete a reflection of Mayo life in the early 1900s as is available. In his later years, JJ continued to photograph and supplemented his income by becoming a Singer Sewer Machine agent. Jack Leonard died in 1960. His funeral took place in Bofeenaun where Phelim Calleary TD delivered the oration over his tricolour draped coffin. A selection of photographs from Jack Leonard's extensive archive is currently on display at the National Museum of Ireland - Country Life in Turlough thanks to his grandson, Anthony Leonard. The exhibition titled 'In My Grandfather's Time' runs until July 23. Anthony continues the family's photographic business and is researching a book on Jack's life and work through his old photographs. You can hear my interview with Anthony Leonard on the life and times of Jack Leonard on CRC 102.9fm, Saturday May 20 from noon.